I am almost always a huge fan of Atelier Versace gowns. There is something about their light colored dresses with impeccable beading that I feel is so luminous and ethereal looking (despite how heavy they must be in actuality). Though not in the same vein of style and detail, Atelier Versace did concoct another winning look with Demi Moore at this year’s ceremony. 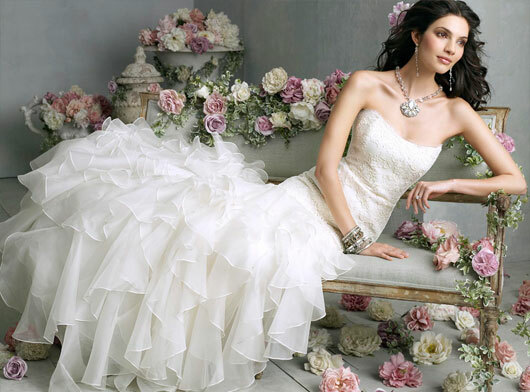 The dress is reminiscent of a Jim Hjelm wedding gown I had seen from their 08/09 collection and had fallen in love with (style # 8864). With a skilled designer and seamstress, I think a tiered skirt like this is sophisticated and romantic, but also edgy in its non-traditional form. Beautiful, swirling colors in Rachel McAdams’ Oscar dress reminded me of circa 1970’s when tie-dye was the hip and hippie trend. It is also evocative of a classic Monet painting. Elie Saab fused these two themes, grunge and classicals, imitating color art but transforming it into something elegant and graceful. Though on the casual side for a Grammy look, I thought Taylor Swift’s Jan. 31, 2010 performance attire complemented her music – a rustic yet contemporary look (she sings country/pop) with a little flashiness (you’ve seen her in many a metallic and sequin gowns) and just enough volume (with her big voice) to capture that delicate balance of comfort without creating an appearance of frumpiness. It was fun, flirty and also comes in an ‘evening mist’ color. Made by Rebecca Taylor, this ‘Habutai” blouse costs $325 and is available at shopbop.com, Saks Fifth Avenue, Bloomingdales and Neiman Marcus. 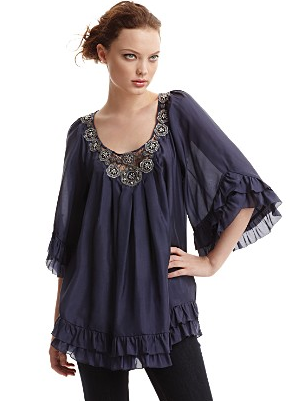 Ack, there was a BCBG tunic-like blouse in a silk georgette fabric with sequin detailing at the collar that I would recommend as a lower cost alternative; however, after seeing it sold out quickly on bloomingdales.com, I have not been able to find it since. Sorry! I have fallen in love with Gretchen Rossi’s dress from the Real Housewives of Orange County Reunion Show. 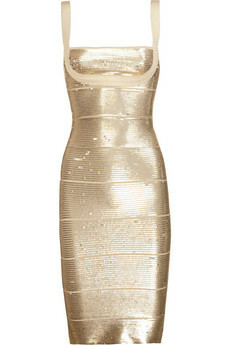 And who else could make such a beautiful dress – it’s by none other than Hervé Léger. For those willing to splurge, this show-stopper can be purchased at Net-A-Porter for $2,070. And for those who are more budget-minded but still want to bedazzle at your next event, I spotted these other styles that are almost as stunning to boot. 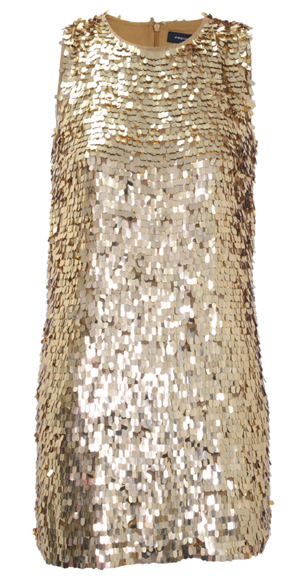 Alice + Olivia Rigby Sequin Dress for $495. French Connection Raindrop Dress on sale right now for $130. I couldn’t resist – other fabulous Hervé Léger dresses with price tags to match. Available at Bergdorf Goodman online for $1,590. This signature dress retails for $1,250.